​One of the largest medieval hospital cemeteries ever discovered in Britain, filled with the remains of more than 1,000 people, has been discovered beneath a Cambridge University college. The burial ground, which has lain hidden for centuries, once stood on the site of what is now St John’s College in Cambridge. It was unearthed during refurbishment work three years ago. While the existence of the cemetery has been known to historians since the mid-20th century, it has only now been made public. The cemetery dates back to around the 13th century. During a six-month dig, a team of 20 archaeologists tunneled their way through the college floors, unearthing the remains of 1,300 people, including 400 complete skeletons. They are thought to be patients of a medieval hospital that stood opposite the graveyard until 1511. The cemetery appeared to “serve the poor,” as the dead were buried without coffins, some even without shrouds. Experts say an on-going DNA analysis of the remains will help cast light on life and death in medieval Britain. Most of the skeletons discovered belonged to 25 to 45-year-old men, Cessford says. “The skeletons were buried in neat rows and once it was full, more were buried on top,” he added. Cessford told RT "it was quite a shocking and amazing feeling" to see the skeletons all revealed. 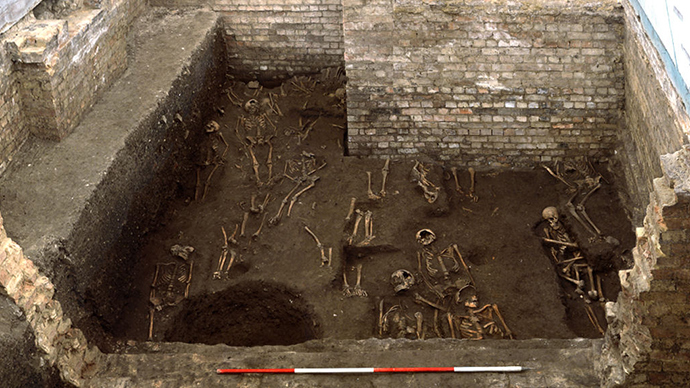 Locals have rumored the hospital cemetery could have been linked to the Black Death, but no evidence of the disease was found in any of the remains. Nor did the team discover any sign of large burial groups from that period. Gravel paths were discovered in the cemetery, suggesting people visited their deceased loved ones, yet the names of the dead still remain a mystery.